When it comes to Standardbred racing, Dave Hudon is certainly no stranger to the track. In fact, he has over 16,000 drives and 2,200 wins! Hudon is representing B.C. in the Western Regional Driving Championship that is being held at Century Downs Racetrack and Casino on Saturday, June 23. Although Hudon has dropped his stable numbers a bit this year, it has made a tremendously positive impact on his racing. “Owning the horses in your stable puts a little more pressure on yourself, but it also gives you the opportunity to enter the horses in the classes that best suit them. The horses get brave and when they are able to win it eliminates some of the stress for the owner,” says Hudon. 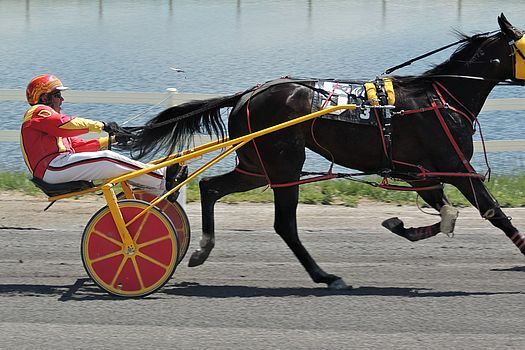 Hudon has previously competed in the Western Regional Driving Championship in 2011 where he won the Western Regional Driving Championship at Fraser Downs Racetrack and Casino in Surrey, B.C. and went on to compete in Charlottetown, P.E.I. for the National Driving Championship. An added element of challenge to the Western Regional Driving Championship is that competitors race with each other’s horses. Hudon didn’t seem stressed about this aspect though. “If the horse has a shot, I’m going to give them a shot,” says Hudon. Given his previous experiences in this competition and throughout his career, we’re sure Hudon will do just fine this weekend. Good luck Dave!